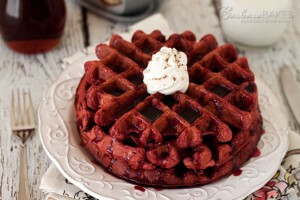 You’ll be surprised to know that this Red Velvet Waffles Recipe is Vegetarian Friendly! Combine the melted butter and brown sugar in a separate large bowl. Whisk in the egg yolks and buttermilk. Mix the cocoa powder and red food coloring in a small bowl to make a smooth paste, then whisk the paste into the butter mixture. Stir the wet ingredients into the dry ingredients just until moistened (the batter should be slightly lumpy).